This month, three new experiments take significant steps in the hunt for dark matter, the elusive substance that appears to make up more than a quarter of the universe, but interacts very rarely with the matter that makes up our world. The experiments — the Axion Dark Matter eXperiment Gen 2, LUX-ZEPLIN (LZ) and the Super Cryogenic Dark Matter Search at SNOLAB — learned in July that each would receive much needed funding from the U.S. Department of Energy and the U.S. National Science Foundation. Each of these "second-generation" experiments will be at least 10 times more sensitive than today's dark matter detectors, increasing the likelihood that they will see the small, rare interactions between dark matter and the regular matter we all interact with every day. As the experimental plans start to coalesce and detector equipment starts to arrive for ADMX Gen2, LZ and SuperCDMS SNOLAB, The Kavli Foundation brought together three scientists to discuss the likelihood that these projects will, at long last, discover dark matter. In the Q+A below, the three researchers share their perspectives on the dark matter hunt. Enectali (Tali) Figueroa-Feliciano is a member of the SuperCDMS collaboration and an associate professor of physics at the MIT Kavli Institute for Astrophysics and Space Research. Harry Nelson is science lead for the LUX-ZEPLIN experiment and professor of physics at the University of California, Santa Barbara. Gray Rybka is co-lead and co-spokesman for the ADMX Gen 2 experiment, and a research assistant professor of physics at the University of Washington. But more than that, dark matter doesn't interact with itself very much either. The matter that we see around us every day interacts with itself: Atoms form molecules, the molecules form dirt, and the dirt forms planets. But that's not the case with dark matter . Dark matter is widely dispersed, and doesn't form dense objects like we're used to. That, combined with the fact that it doesn't interact with our type of matter very often, makes it hard to detect. Tali Figueroa-Feliciano: What Harry says is exactly right. In my mind, nature is being coy. There's something we just don't understand about the internal structure of how the universe works. When theorists write down all the ways dark matter might interact with our particles, they find, for the simplest models, that we should have seen it already. So even though we haven't found it yet, there's a message there, one that we're trying to decode now. TKF: In fact, nature is being so coy that we don't yet even know what dark matter particles look like. Gray, your experiment —— ADMX —— looks for a different particle altogether than the one that Tali and Harry look for. Why is that? Rybka: As you say, my project — the Axion Dark Matter eXperiment, or ADMX —searches for a theoretical type of dark matter particle called the axion, which is extremely lightweight with neither electric charge nor spin. Harry and Tali look for a different type of dark matter called the WIMP, for Weakly Interacting Massive Particle, which describes a number of theorized particles that interact with our world very weakly and very rarely. We've been updating the ADMX experiment since 2010 and have demonstrated that we have the tools necessary to see axions if they are out there. ADMX is a scanning experiment, where we scan the various masses this axion could have, one at a time. How fast we scan depends on how cold we can make the experiment. With Gen2, we're buying a very, very powerful refrigerator that will arrive next month. Once it arrives, we'll be able to scan very, very quickly and we feel we'll have a much better chance of finding axions — if they're out there. That said, I think it's really important to stress how complementary these three searches are. Together, we look in a lot of the places where dark matter could be. But we certainly don't cover all of the options. As Harry says, it could be that dark matter is there, but our three experiments will never see anything because we're looking in the wrong place — it could be in another fork of the river, where we haven't even started looking yet. LUX physicist Jeremy Mock inspected the LUX detector before the large tank was filled with more than 70,000 gallons of ultra-pure water. The water shields the detector from background radiation. My experiment is currently running in Soudan, Minnesota, inside a mine that's about a half a kilometer (about 1,640 feet) underground. 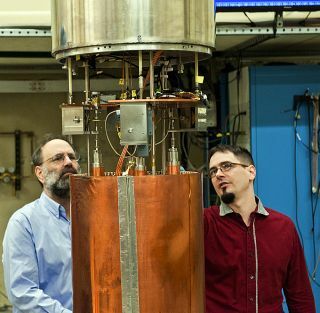 This experiment, called SuperCDMS Soudan, was designed to demonstrate a new technology we've been developing that allows us to search for WIMPs that are on the lighter-mass side. It turns out that certain classes of WIMPs, ones that are lighter than Harry searches for, deposit very little energy into detectors. Our detectors are able to distinguish very small amounts of energy deposited in the detector from all the many different signals that we get from radioactive materials, cosmic rays, and all sorts of other things that stream though our detectors. Being able to make that separation is very important, both for SuperCDMS and for LZ. When we start to do that with dark matter, we're going to see something new. That's just how scientific progress works. Right now, we can't see through the wall because we haven't figured out what the wall is made of. But once we understand what's in the wall — my analogy for dark matter — we'll see through it and see to the next thing. TKF: There's clearly a lot to be done once we find even just one type of dark matter particle. But it sounds like there could be a whole new zoo of dark particles. Do you think we're going to need a "Dark Standard Model?" The dark matter sector may be as complex — or perhaps even five times as complex — as ours. Just as we're made mostly of atoms made up of electrons and nuclei, maybe dark matter is too. In some of the searches for WIMPs, you have to be careful about that. It may be that the way these things interact with our matter is rather different than the simplest possible case that we're looking for.